What makes our stuffed toys different from our competitors is the quality and pin point accuracy of specific animal characteristics that are used in each production. Artists create each animal from portraits of the creature in its natural habitat. Most fabrics are custom designed and exclusively manufactured to our exacting specifications. 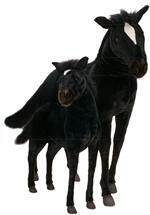 The animal’s “coats” are meticulously hand-cut and trimmed, never stamped out by machine. The animals are hand sewn “inside out”, resulting in the minimization of seams. This development of an exceptional internal stitching method allows our artisans to create effects like muscle tone and “features” unique to each creature. On average, there are 42 separate pieces required to make each animal. (Some animals have as many as 240 different parts!) The subtle coloring on the stuffed animals is hand painted or airbrushed by specially trained artisans. Each animal is hand finished with loving detail to give them the life-like look yet sweet face and cuddly feel that is unmistakable. Want to know more about these precious life-like toys? 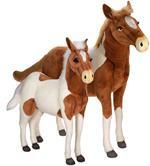 Read more about hansa stuffed animals in our resource page section.